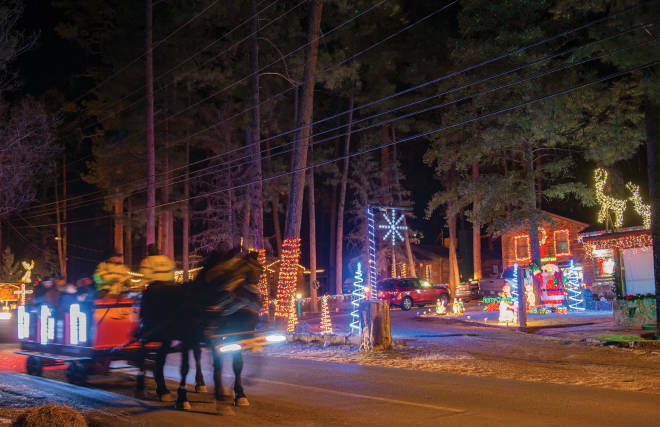 Twas the weekend before Christmas, and all through the house, not a creature was stirring—until we heard sleigh bells ring-ting-tingling in Ruidoso’s upper canyon. We sprang up, threw on our coats, and dashed onto the balcony to wave at the sleigh riders and holler Merry Christmas! As the horse-drawn sleighs disappeared into the trees, we slipped back inside our little cabin and warmed our hands by the big stone fireplace. If your Christmas feels like a three-ring circus inside a small tent, consider taking your show on the road to Ruidoso. In the heart of southern New Mexico’s Sierra Blanca Mountains, the town bursts with outdoor recreation, cozy cabins, and made-to-order holiday cheer. With fewer than 8,000 residents, it’s more than the perfect small mountain town. It’s also an affordable winter destination for drawing together an extended family for a week of rest and play. About a 2-hour drive from Albuquerque or Las Cruces, the village has long lured desert dwellers to its perch just shy of 7,000 feet. The summers here are cool and winter has the tantalizing possibility of snowy streets—and plenty of other snow to play in. The opening of Ski Apache on December 5 may mark the start of winter here, but the holiday season starts on December 1, when the Festival of Lights Parade spreads blinking, twinkling cheer down the main drag. Downtown merchants get in the mood, and every light pole is swagged with glowing snowflakes, every storefront draped with illuminated icicles. (Pick up some timely gifts at Mitchell’s Silver, where you’ll find an outstanding collection of Native jewelry from New Mexico and Arizona.) The whole month is full of old-fashioned family fun, like the annual holiday Ping-Pong Tournament at the community center and the essential stroll through School House Park to see the lights that come on every night at dusk. Ruidoso’s own Dalí Ballet Company puts visions of sugarplums in their heads with three performances of The Nutcracker at the Spencer Theater, in Alto. Designed by world-class New Mexico architect Antoine Predock, the theater also holds several large and spectacular glass installations by Dale Chihuly. Definitely make a stop at the Inn of the Mountain Gods Resort & Casino and snap a family photo with the resort’s two-story Christmas tree, which patiently poses as background in the towering lobby. On Christmas Eve, you can drive out to Lincoln Historic Site, where luminarias glow along the walls and rooftops, and Santa arrives on a longhorn steer. How cool is that? Perhaps the most persuasive reason to spend some of your winter break in Ruidoso is the abundance of outdoor activities for burning off calories, blowing off steam, and doing that secretly fun stuff that Mom calls “family bonding.” (Bonus: getting the little people out of the house while the dinner is prepped, presents wrapped, and much-needed naps taken.) The tubing, for one thing, is truly spectacular. Owner “Tubin’ Tommy” Dorgan brags that Ruidoso Winter Park, just past the north end of town, is the biggest and best tubing operation in the Rockies, with three magic carpet lifts and a massive snowmaking system. Even in late November, when snowfall may have been light, Winter Park’s deep base of snow blankets the runs that stripe this hillside along the road to Ski Apache. Warm up by an outdoor fire pit then hit the food trucks for a snack—or rent a private “igloo” enclosure, complete with fire, pizza, and hot chocolate. Rates drop at 3:30 p.m. for “twilight tubing” until 8 p.m. on the illuminated hill, and bonus days offer all-day rides for the single ticket price. The skiing is surprisingly good, too, at one of the nation’s southernmost slopes. Ski Apache is a treasure, with a gondola whisking skiers and boarders to 11,500 feet on Sierra Blanca Peak, the tallest mountain in the region. The resort, owned and operated by the Mescalero Apache tribe, records an average of 15 feet of snowfall, with snowmaking on at least a third of the runs.Experienced skiers and boarders dig the 1,900-vertical-foot drop, challenging bump runs, and kitted-out terrain park, while beginners appreciate the wide bowl, and the long, gentle runs around the base area. Need some alone time? The Adventure Center entertains kids 4–12 with ski lessons, playtime, and lunch while you rip through your runs. Read more: Want something else to do in the area? Check out Cloudcroft. 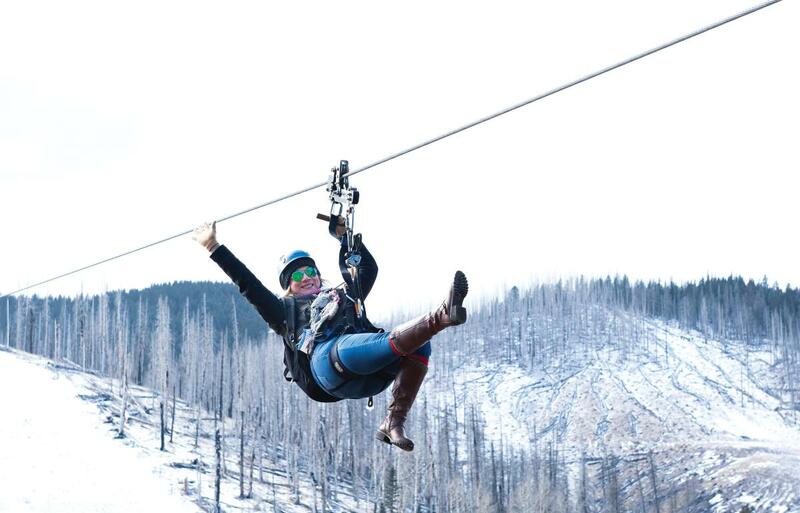 Thrill seekers geek out over Ski Apache’s Wind Rider Zip Tour, an adrenaline-pumping ride that rips down more than a mile and a half from the summit in three stages. Trained guides help you through each stage of a ride that’s more exhilarating than scary and affords stunning views: On a clear day, you can see the shimmering bed of White Sands. Although I was apprehensive, I loved my maiden voyage, whooping my way down the mountain next to a middle-school-aged girl who was much more composed. (Two people can ride side by side on this double line.) Kids at least 10 years old, 50 pounds, and 52 inches tall are welcome to zip. The whole thing takes about 90 minutes. Hot tip: Dress in your warmest windproof attire, including neck-warmer, gloves, goggles, and maybe even some disposable boot-warmer inserts. For a slightly mellower day you can take the whole herd out for a horseback ride on a mountain trail with insane scenery. Around the holidays, Grindstone Stables leads five rides each day up Townsend Ridge, with gorgeous views of Grindstone Lake. Kids as young as five can climb aboard their own pint-size ponies, and they don’t even have to steer—mounted guides lead with ropes. Grown-ups have to hold their own reins, but not much steering is required for this slow ride on half-Percherons whose heritage as plow horses gives them a gentle, sure-footed demeanor. Never been on a horse? Looking for a nag named Ol’ Maude or La-Z-Boy? This is your trail ride. Set aside at least one evening for the Grindstone Stables sleigh rides. Even though the big red sleighs roll over asphalt on rubber tires, the gigantic draft horses pulling them shake their festive bells with every step, from Thanksgiving through the first week of the new year. (Tungsten-spiked shoes keep them steady even on snow and ice.) The rides depart every 15 minutes for half-hour tours through the upper canyon, where houses drip with twinkle lights and jolly riders shout holiday greetings. Each holds about 16 people on rows of benches, and riders are given thick blankets to put over their legs. Still, puffy coats, warm boots, and snuggling are recommended. Get there early so the kids can meet the biggest horses they’ve ever seen. For a cozy winter stay, look in the upper canyon, which is lined with rustic condos, quirky retro cabins, and spacious rental homes. The tall evergreens give the canyon an over-the-river-and-through-the-woods feel, and if you squint just right, the deer grazing in every front yard look like reindeer. Start your search for holiday digs on the Village of Ruidoso website (discoverruidoso.com), which includes links to cabin-rental and property-management organizations. Storybook Cabins has charming studios with a full kitchen, whirlpool tub, fireplaces, comfy sofas, and a four-poster log bed. If “resort” beats “rustic” in your book, check out the MCM Eleganté Lodge and Resort or the Inn of the Mountain Gods Resort & Casino. 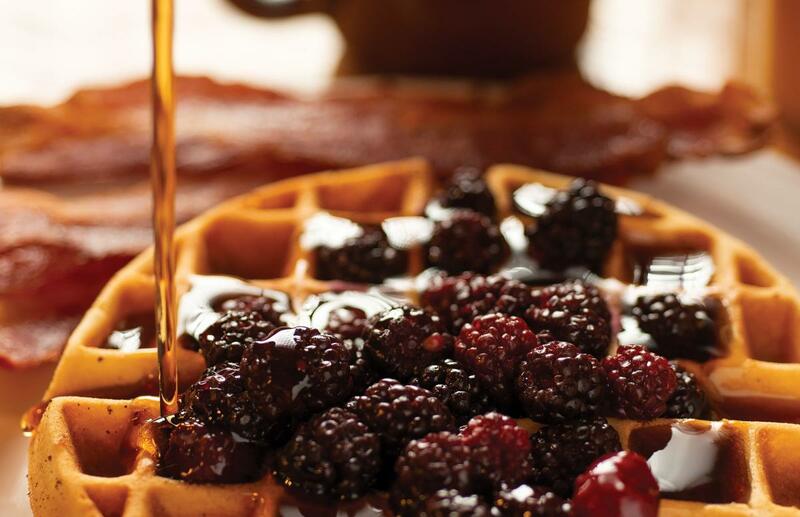 Power up for a big day of fun with breakfast at the Log Cabin Restaurant, a local favorite where the taxidermy on the walls and the pancakes on your plate achieve epic proportions. I happily took advantage of the bottomless coffeepot. Sacred Grounds Coffee and Tea House is a great place to stop in for a quick espresso or to hang out, read the paper, and finish your Christmas cards. At night there’s a bar menu alongside New Mexico beers, wine, and spirits from the Glencoe Distillery. Cornerstone Bakery & Cafe opens early with fresh-baked pastries and gourmet coffee, and they’ll help keep the kids entertained until you’re fully caffeinated by giving them balls of dough and miniature rolling pins. When you need a nightcap, check out Hidden Tap, a downtown watering hole with an easy, fun vibe, New Mexico beers, arcade games, and live music. If the Skee-Ball has made you peckish, you can order pub grub there or slip over to Hunt and Harvest, an elegant spot serving elevated comfort food with a New Mexico accent, like free-range chicken and green chile pot pie, blue corn tacos stuffed with venison asada, and ghost pepper mac and cheese. Be sure to sample the excellent local wines at Noisy Water Winery, where you can also pick up a few bottles for your holiday dinner. If you’re not cooking Christmas Eve or Christmas Day, the Inn of the Mountain Gods Resort & Casino puts out a huge spread in its Gathering of Nations Buffet, offers casual ambience in the Broken Arrow Tap Room, and serves a special menu at Wendell’s Steakhouse. Plus, if the kids get antsy you can send them to the arcade room.